Mrs Thomson continues to co-ordinate the Green Tree award (we currently have our Silver Award and are working towards the Gold Award). As part of this project, this term she organised a writing competition, where children were challenged to write either a poem or piece of prose on the theme of Spring. The winning class were awarded custody of some very special ‘Living Eggs’. Living Eggs is a two-week programme which provides all you need to hatch chicks in school. 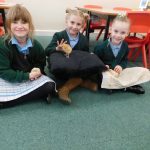 So on Monday 29th February, 10 eggs, an incubator and brooder box were delivered much to the enormous excitement of the winning class – Year 3 – and the waiting began…as did the snow!! Thankfully Miss Kennedy, who lives locally managed to get into school several times each day to check on progress and care for the chicks. 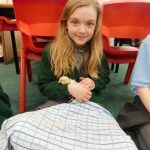 When the school re-opened on the Monday, the pupils were delighted to find that out of the 10 eggs we had 7 healthy chicks – each of whom have now been named by the children. A range of activities and learning was planned around the Living Eggs project and it was with a big wrench that we had to say goodbye to them at the end of the two weeks. However, the good news is that we will still be able to keep in touch with and watch the progress of the two hen chicks because Miss Allon has decided to adopt them! The male birds were returned to the Living Eggs company, who will take them to live on a local free range farm.